Go big or go home! 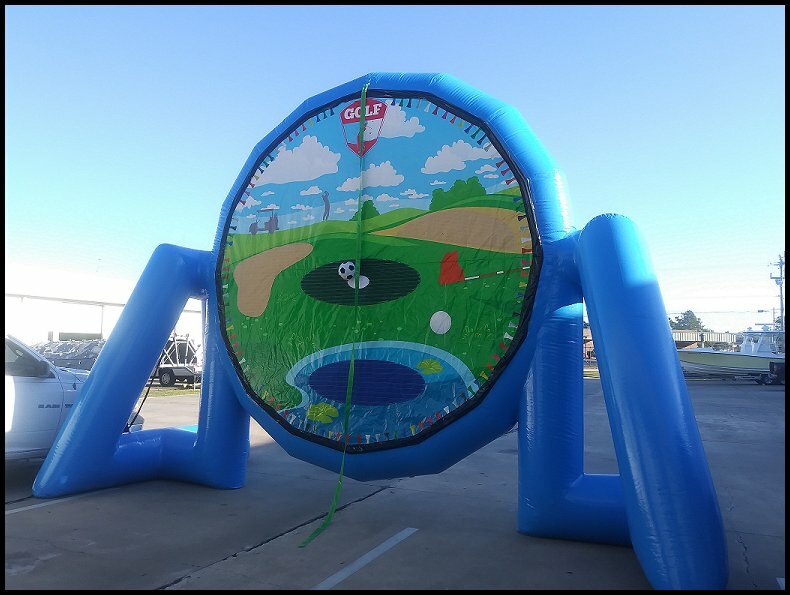 Jumpin Beans has added yet another cool addition. This unit is 90’, that’s right 90’ Long and 13’ wide. Make sure you have plenty of room for this monster! This unit also requires 3 blowers so (3) separate 20 amp breakers are required within 100’ of this unit. This unit can only be used DRY. The first picture, below left, is the first part of Big Red (little red). The second picture, below right, is the first two pieces of Big Red (middle Red). The picture above is Big Red (all three pieces). 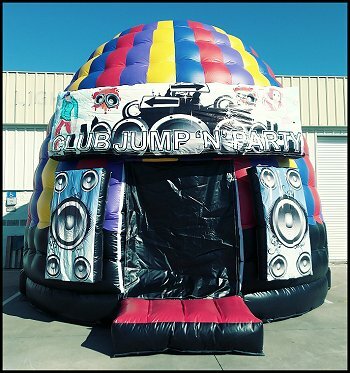 Definitely one of the coolest items Jumpin Beans has added to its inventory! 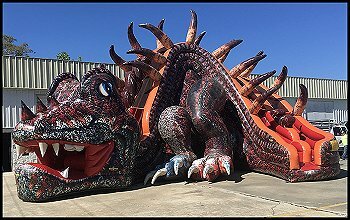 Massive 24’x25’ and an impressive 24’ tall. 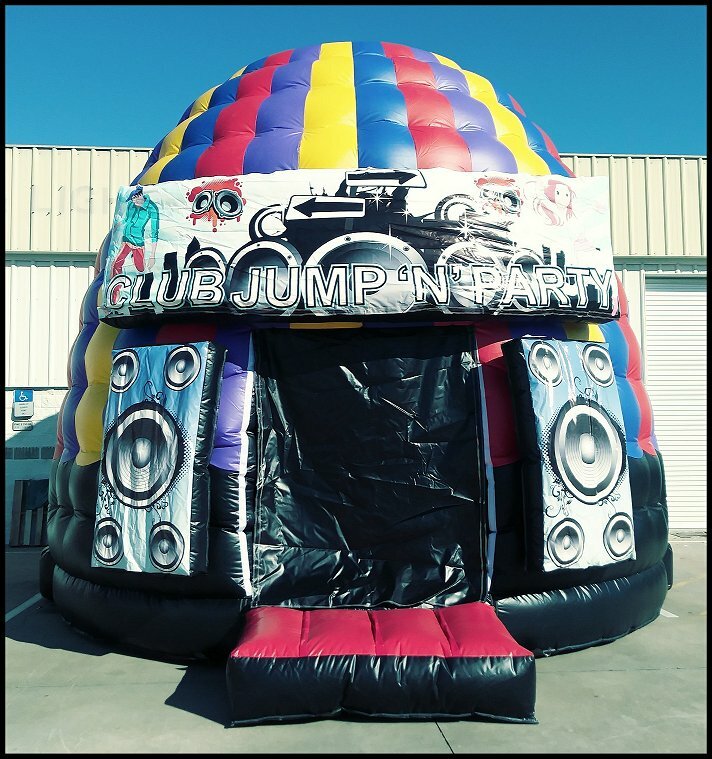 Unit comes complete with a powerful bluetooth speaker to play your favorite songs AND disco lights inside unit. 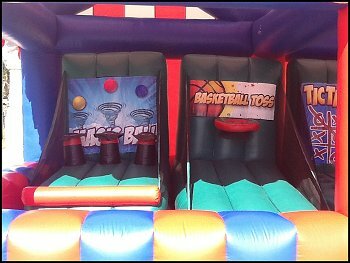 Great addition for a school event, sweet 16 party, wedding, bar/bat mitzvah or just to have an amazing party! Just when you think we can’t get something bigger, we do. 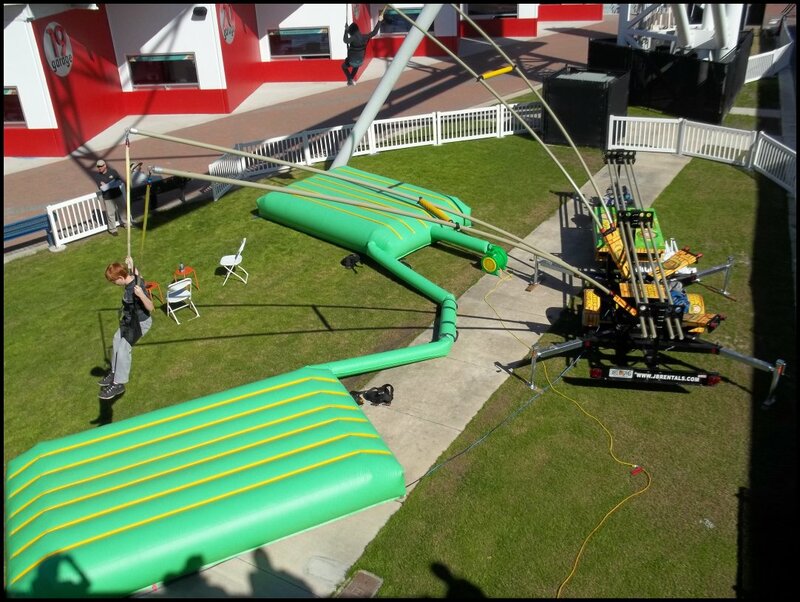 This is not a backyard party slide! This is to get massive attention to promote a huge event or show. 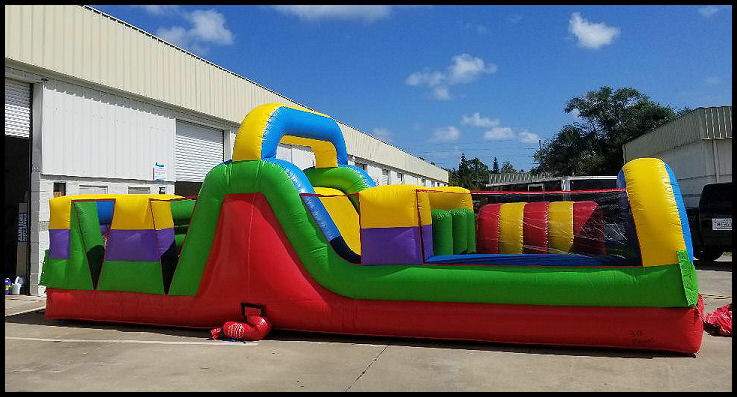 This unit is 37’x32’x29’ and has two huge slides. One entrance at the the mouth and the other is at the tail. Rates start at $900.00+tax to rent this monster. We must be able to drive to the exact location of set up. 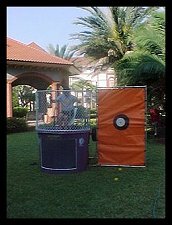 The Hippo game is 30’ in diameter. This unit has two sides to choose from. 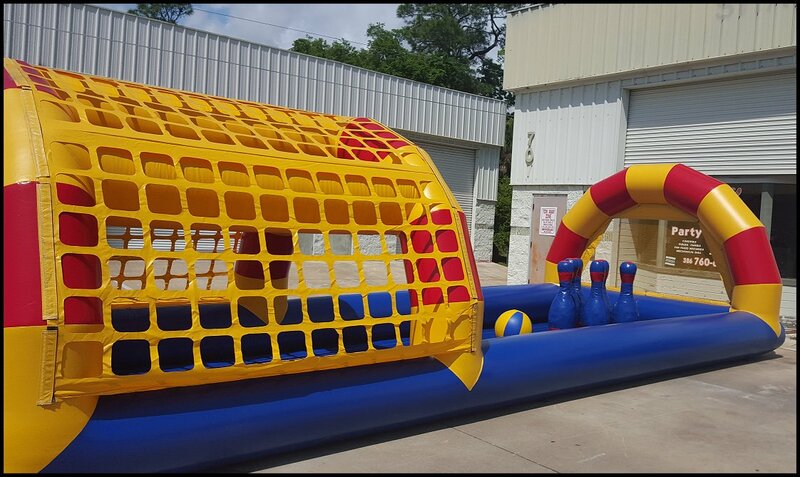 Who wants a bowling alley at their next party or event? 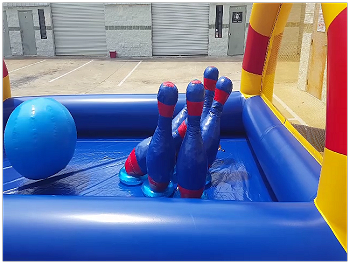 Huge inflatable bowling area with pins. Unit must be on a hard, flat surface. How about the most impressive inflatable football game ever invented! Jumpin Beans has it now. This unit has two sections. A kicking and throwing area. 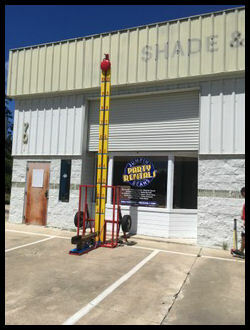 Entire unit is 20'x30' and a whooping 20' in height. Give us lots of room and 2 separate breakers within 100' of the unit. Howdy folks, welcome to the old west. 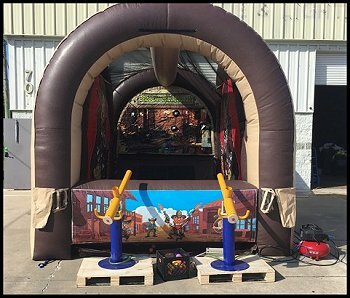 This unit is 18'x13'x13'. 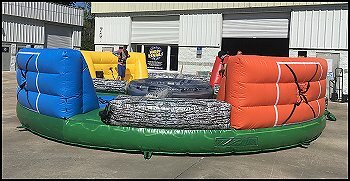 You can use this game with the pictured air cannons or we have modified paint ball guns that shoot the foam balls at the gallery as well. This unit requires two separate 20 amp breakers within 100'. 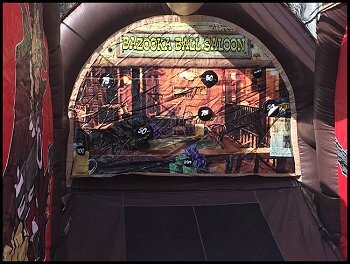 It is 25'x15'x11' and full of cool stuff to keep the toddlers busy. 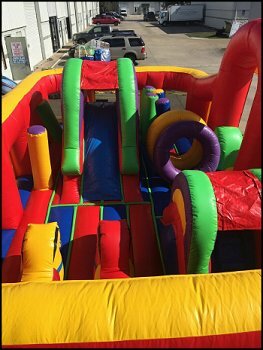 Two slides, tons of fun pop ups and plenty of bouncing area make this a hit for the kids. Unit must be used DRY only! 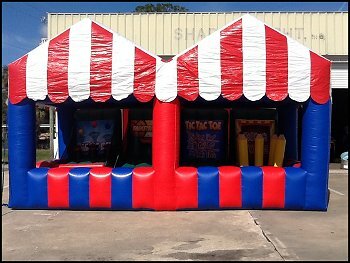 This huge carnival tent can be rented either with the 4 games or we can remove the games and you have a 22'x12'x14' inflated tent to use for an event. Use it to set that carnival mood, serving area for concessions or as an attention getter. 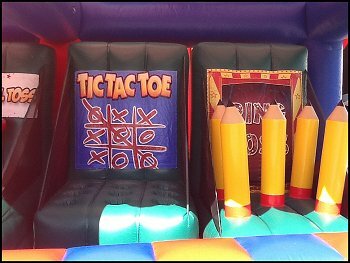 If using with the games, you have 4 cool carnival games that can be easily manned with limited staff. Jumpin Beans out did itself yet again! 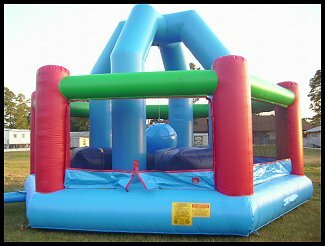 This massive unit is a must have your your next festival or big event. 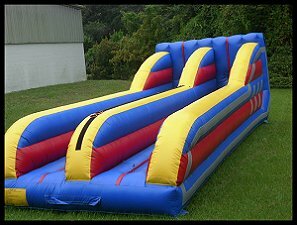 You have seen similar items on your favorite shows that test the skill and balance of the participants. Climb the ladder and take a leap and don't stop. 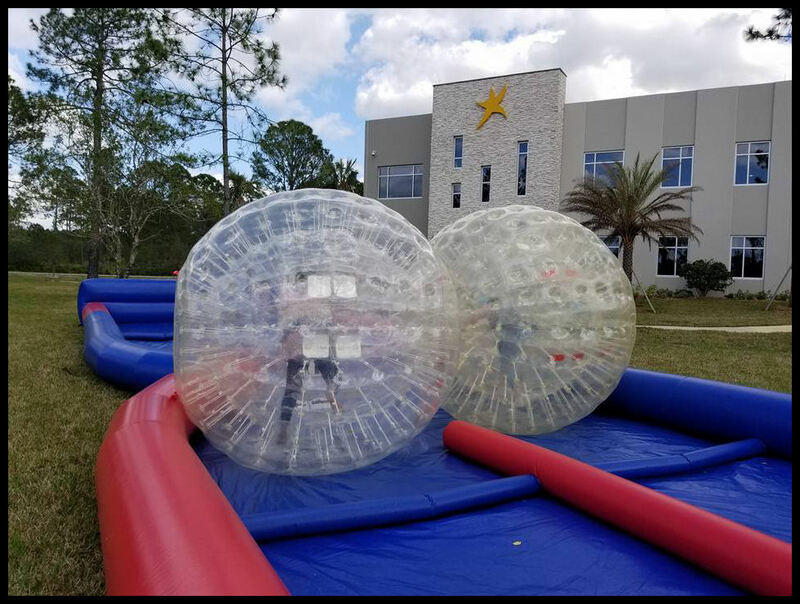 Check out our experts on the video and how they travel from ball to ball while trying to stay on top of the inflated balls. It may not be easy but it sure is plenty of fun. The unit MUST be driven to the exact location for set up. It is 40' long and 22' wide. Make it to the top and ring the buzzer. 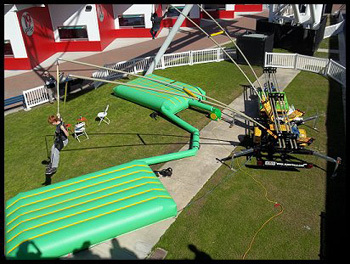 Your group can have their own American Ninja Warrior competition. 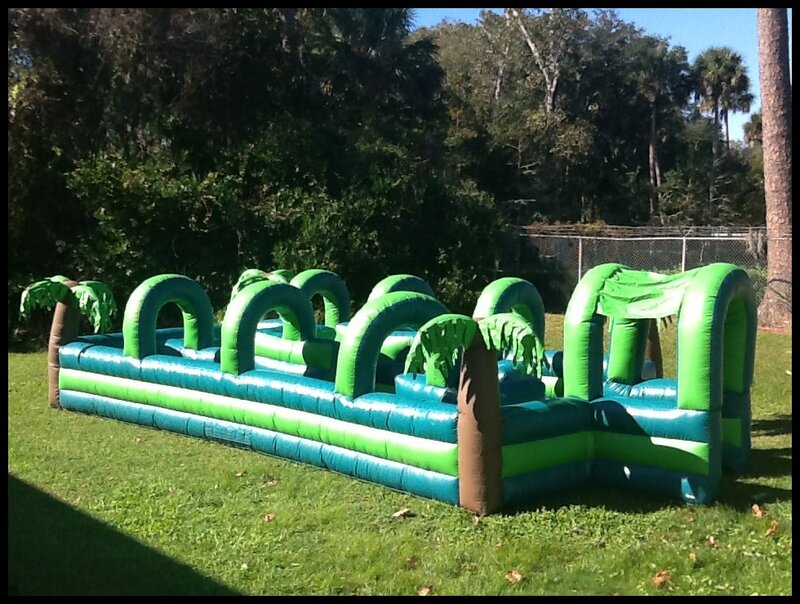 You can add one of our exciting Obstacle Courses and end with a Giant Trike Race. 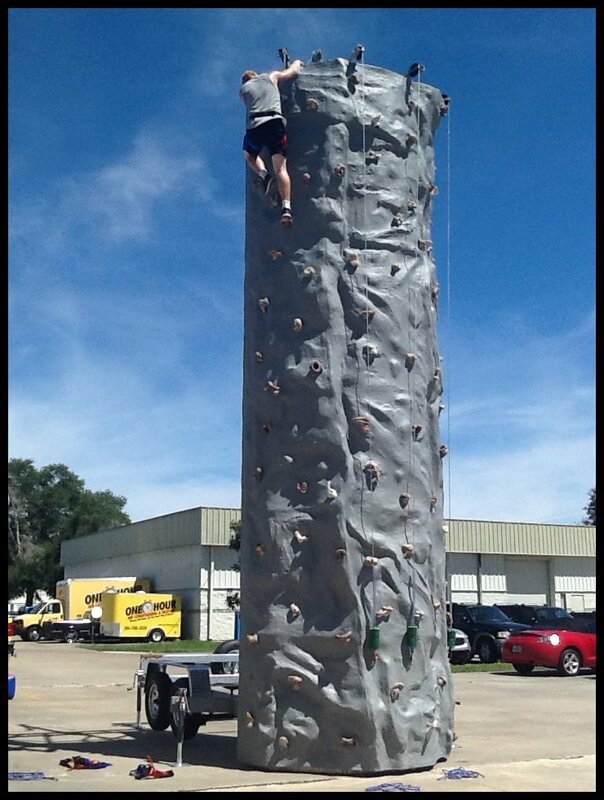 Rockwall is built on a trailer so we must be able to drive to its location. Rockwall works best in a 20'x20' area. Comes complete with trained attendants to harness and supervise. Four people climb into the ring and stand on big inflated columns. Participants push a large inflated ball and try to knock the others off their columns. 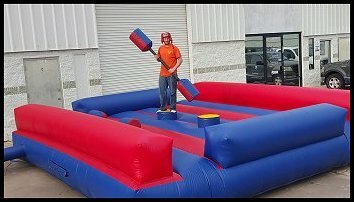 A new and exciting twist to a Joust. Unit is 28' x 28' and 17' tall. Unit must be used DRY only . Do you want a game to challenge you? This game will pit two opponents against each other to see who has better balance. Try it and you will see that the biggest person doesn't necessarily win. Unit is rented DRY only. 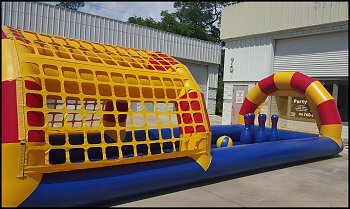 Unit can be rented individually or up to four stations operated at once. Jump 15' in the air! How many flips can you do before you come back down. 2 of the 4 stations shown in picture. 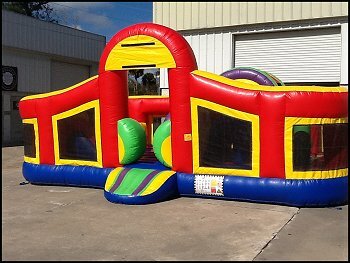 Rental rates start at $600.00 for local deliveries in the Daytona Beach area. Rates may vary depending on location, number of stations staffed and hours of the event. Please call for a quote. These suits are just too cool. 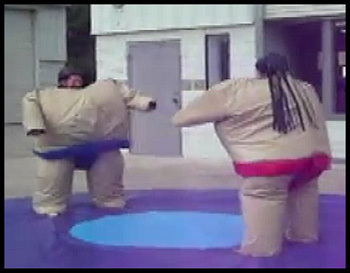 Participants put these on and face off for a hilarious wrestling match, just watch the video! Great fun to use and just as fun to watch. Minimum height requirement is at least 5' tall. 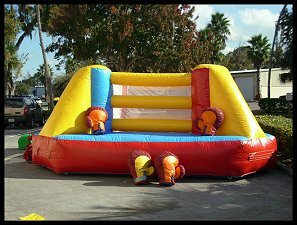 This is a full-size inflated ring complete with two pairs of huge padded gloves. Challenge your friends and see that this is no ordinary boxing match. Unit is rented DRY only. Take two people competing against each other trying to make it farther down their lane without being taken back to the start. The result is fun no matter who wins! Great for many ages. 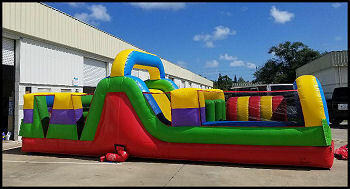 Unit is 32' x 12'. Unit is rented DRY only. Another unique and exciting game to try. 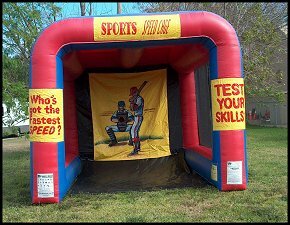 Throw softballs or baseballs to the catcher and see who has the best accuracy and fastest pitches. Perfect to compliment your backyard get-together. 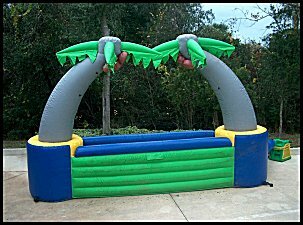 Tropical bar can be used as a bar or serving area. Backside of unit has built-in ice bin and topside of unit can be used to serve food, drinks or use your imagination. Unit is approx. 12' x 3' and 7' tall. Bar can be rented for just $99.00! 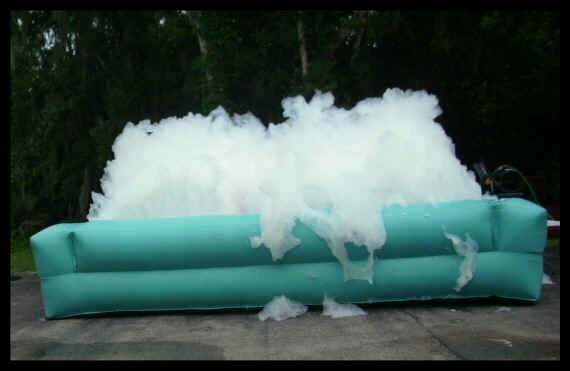 Unit can fill up this area in a few minutes and comes with enough foam to last approx 4 hours. Rental rate is $300.00 for local deliveries. 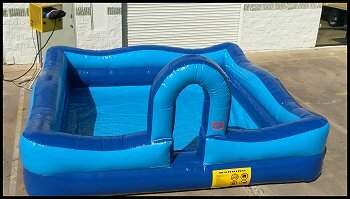 Add it to a waterslide for just $99.00. Unit is 15'x15' and has a vinyl lined floor. With this new pit, unit can be used indoors as well as outdoors. Rental comes with enough foam to do a typical 4 hour party. 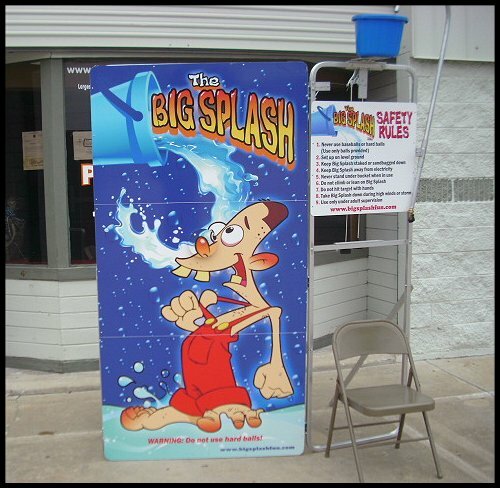 Get soaked at Water tag!! Player with the least amount of water in their vest is the winner. 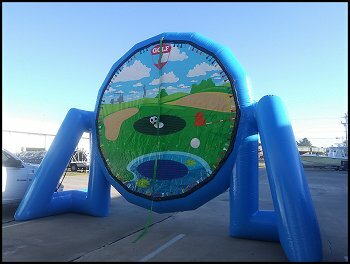 Can play with up to 7 players at a time. Game includes 14 water soaker's and vests. 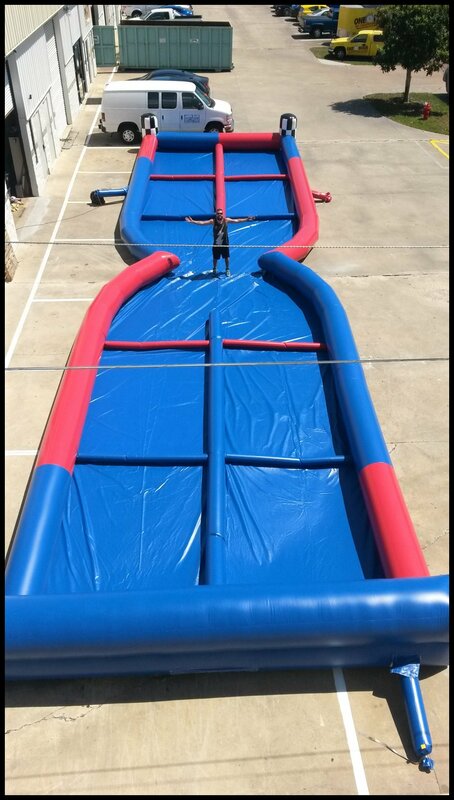 25' x 35'. This game can also be used as an inflatable maze with the following options: Blind fold treasure hunt, potato sack race, soccer madness, foam pit. How cool is this? The inflated screen blows up to an incredible 20'W x 13' H x 8'L. Rental can include our commercial BEN-Q projector that can be used with a VCR or DVD to show your favorite movie or hook it up to a TV and show your favorite sporting event. 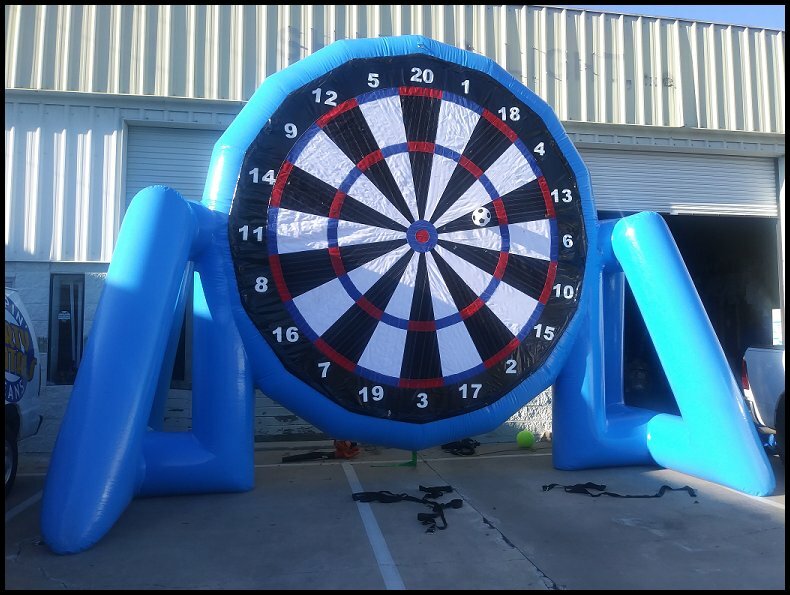 You can rent the screen by itself and add an eye catching banner to promote your business or an event. 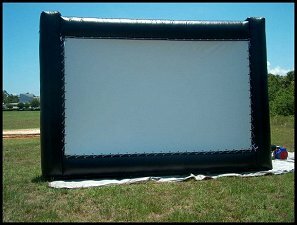 Inflatable screen too big? 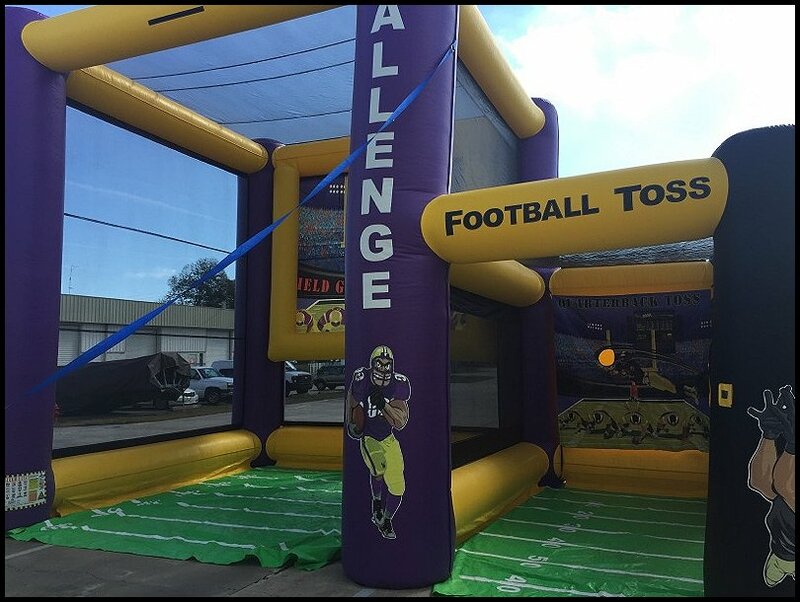 We have a pull up screen that is 8' x 8' or see another option to the right. 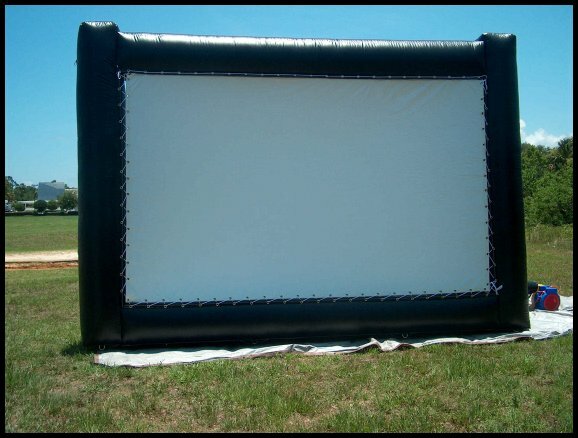 Because of it's popularity, we have added another large movie screen! Note: Both movie/game screens must be used either when it is dark outside or in an enclosed room that can get dark. Play Pitch n Burst and make a Splash! It's safe and simple to play. 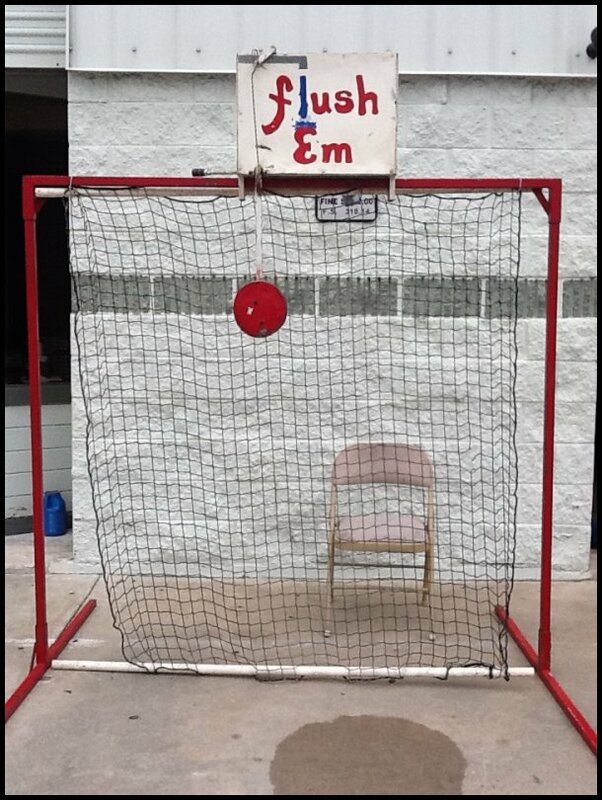 Pitch a ball, hit a target and Splash! - a water balloon bursts overhead. Throw a baseball, hit the target and the participant gets dunked in a tank of 500 gallons of water. This unit is built on a trailer and needs to be driven to the location where you want it set up. Rental rate is $175.00 +tax. 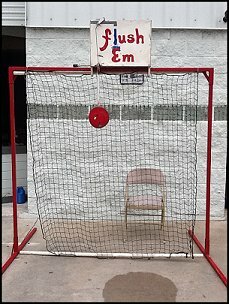 Victim sits in the chair and participants throw balls at target. 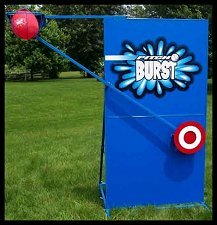 Hit the target and person gets soaked. Unit needs no power but water spicket needs to be close by.